Wellingtonians and visitors to the capital are invited to attend six Sunday concerts over winter at Pukeahu National War Memorial Park. “It’s an exciting programme to extend the use of Pukeahu beyond purely ceremonial events,” says Paul Riley, Pukeahu National War Memorial Curator. 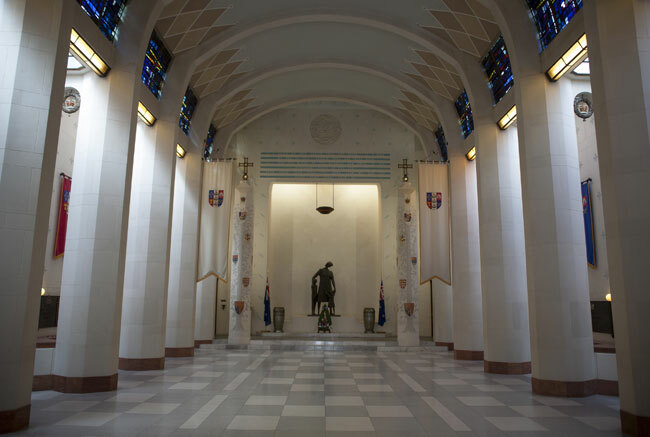 The National War Memorial's Hall of Memories. The concerts begin this Sunday (22 May) with the RNZAF Band Woodwind Trio playing music from the great masters. The concerts continue monthly through to October. 2 October Classical saxophone and voice - Australasia’s leading classical saxophonists team up with vocalists for a concert of renaissance and baroque music. Concerts will commence at 4pm and conclude at 4:45pm and guests are invited to then attend the Last Post ceremony at 5:00pm. More details about the Winter Concert series can be found at: http://www.mch.govt.nz/pukeahu/news-events/events.